Beginning the adoption process gave me hope that we would be parents. I didn't know how long it would take, but after 6 years of battling through IF and overcoming 6 miscarriages, I knew that I could wait as long as it would take. Would it be 6 months? Would it be another 6 years? It didn't really matter because I finally had hope, and I knew that it would be eventually. There is that word again; eventually. That is the word that kept popping in my mind on a regular basis from the first time Dan said to me that we should look into adoption. Beginning at that moment, I knew, eventually we would be parents. 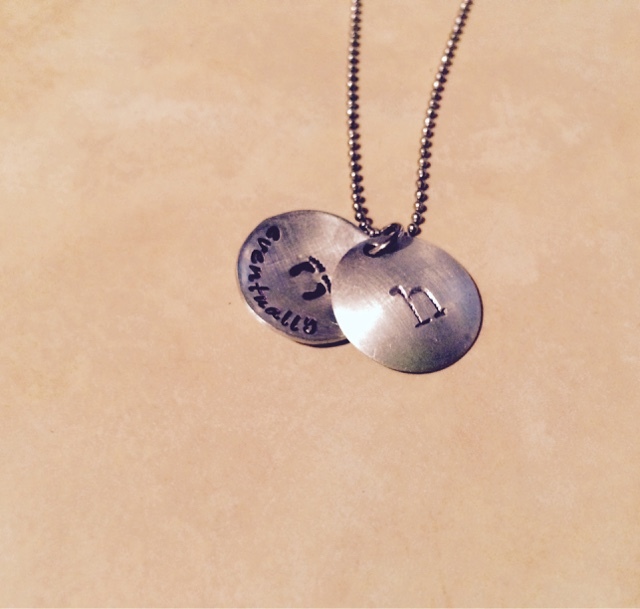 I ordered this necklace to wear as a reminder, especially on those exceptionally hard days, that eventually it would happen. 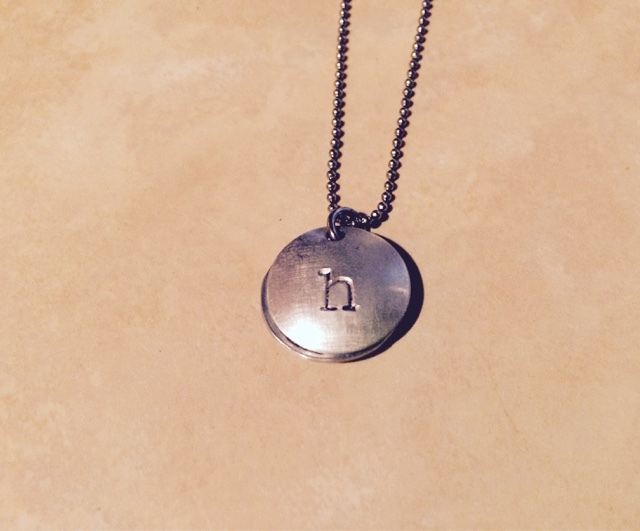 The "h" is for our last name, and you can see the baby feet with that word that kept popping in my mind; eventually. And wouldn't you know it, eventually came sooner for us than we expected. Our homestudy was approved at the beginning of June 2014, we were contacted by our daughter's beautiful birth mother at the beginning of July 2014, and brought our daughter home (that little baby "h" who was represented by two tiny footprints and the word eventually) in November 2014. Sometimes I still wear that necklace as a reminder that eventually the best things really do come to those who wait. So whatever gives you all hope and encouragement, whether it is a word, a piece of jewelry, blogging, your support system, please hold onto it. Share it with me, what gives you hope? I've heard the comments and questions directly and indirectly. How could you pay someone else to raise your child? Don't you feel guilty going back to work and missing all of this time with your daughter? I just don't know how working moms do it, etc. Our daughter is 8 months old. I had the luxury and privilege of staying home with her full-time for her first 3 months. Was it long enough for me; no. But, it was more time than some people get to have, so I was grateful for it and I needed to go back to work. Not that anyone else needs anymore explanation than that, but my husband and I decided together. It wasn't a decision we made lightly. No decision we have ever made in regard to starting our family or parenting our child has been made lightly. Going back to work was hard on me. I cried frequently for the first 6 months, especially on Monday mornings when I dropped Mira off at daycare after getting to spend all weekend with her. I felt guilty like I was doing some huge injustice to our daughter by not being the one who spent 24 hours a day, 7 days a week with her. That is how I made myself feel and that is how I let some other people make me feel. But over the last few months, I have realized I am doing no injustice to our daughter. She is a thriving, crawling, standing, laughing, developing right on track, little ball of happy-as-can-be 8 month old in spite of being at daycare without me (gasp) during the day. Trust me, it's harder on me than on her, lol. Her dad and I both work full-time day jobs. That means we are both with her in the late afternoons and nights, and all weekend. Our time together is quality time and we make the most of it. Neither one of us is any more or less of a parent than the other one, or any more or less a parent who stays home full-time, or travels with their job and is gone frequently, or works nights and weekends, or works 2 jobs. I believe that every good parent is doing the best they can, and providing for their child in the way they need to. I think as good parents, whatever we decide to do is probably a hard decision that we constantly question, so we don't need other people questioning it for us or putting their two cents in (unless asked, of course). Yes, Mira is in daycare during the day. And as my mom pointed out to me (thank you mom), this is her routine and she is adjusted to it. This is her normal. Mira loves Miss Lori and the other kids at daycare with her. She even has a best little friend, P, who is the same age. Those two light up around each other. When I drop her off in the mornings, I am not just leaving her with a stranger. I am leaving her with a woman who we trust. I am leaving her with a woman who loves her, cares for her, teaches her, spends time with her, and yes, even helps raise her. I would get so offended when I would hear people say that working parents pay other people to raise their children. But the truth is that we do pay someone else to help us raise our daughter. And there are also people that we don't pay who help us raise our daughter. What is so wrong with that? Have you ever heard the saying, "It takes a village to raise a child"? Well, there is some truth to it. It really does take a village. A village of family, friends, and for us, our daycare provider. Miss Lori, thank you for being our daycare provider and for loving and caring for our daughter as part of our village. Yes, I'm a working mom...sorrynotsorry. A funny thing happened on the way to infertility...we finally became parents. Well, not really on the way to infertility, more like after infertility. Anyway, infertility did lead us to parenthood, talk about ironic. So it's true, my struggle became my strength, I'm grateful for the valleys I had to go through that led me to the mountain top, everything happened the way it was supposed to in its own time, I wouldn't change the way things happened (but some things I would), and all of those other cliche things that people seem to say when they have finally achieved what they have always wanted after working hard and never giving up (except there were many times I did give up, or at least wanted to). So, I have been avoiding this blog. True, I am very busy with work, an 8 month old, personal life, goals like losing weight. But mostly, I've been avoiding. I had writer's block for a while. But mainly it's that I don't know what to say anymore. Do I talk about motherhood after infertility? Do I talk about the adoption process? Do I talk about how I still struggle with infertility? I don't know. I never envisioned myself writing about anything in this blog except infertility and miscarriage, so I find myself in uncharted territory. To write about motherhood in a blog that was started to educate and inform people about infertility, share my struggles, help myself heal, and hopefully help other women, doesn't somehow seem appropriate. Or, maybe it seems like some kind of a betrayal. I don't know if I am ready to write about adoption, or the adoption process or becoming a mom through adoption because it all still seems so personal, private, and surreal. And I am kind of scared to reveal too much about our daughter and her story (because it really is just as much her story as ours). I want to be respectful to all involved. To write about how there are still times I struggle with infertility and loss seems like it would take away from how happy and grateful I am to finally be a mom, even though those two things are separate. I love blogging and I am at a crossroads here. What do I do to keep my blog active while honoring what started it, as well as where I am at in my journey now? To be determined, I guess. I should have blogged about this long before now, but life has been crazy and busy...crazy-busy. That about sums it up. I am sitting here next to our sleeping 2 month old daughter, Mira. Yes! We. Are. Parents! In July of 2014, an expectant mother connected with us thru a mutual friend. She was about 5.5 months into her pregnancy. Shortly after contacting us, the three of us decided that we would continue on the journey together. We all met with the adoption agency and became officially matched. The journey to through the match was a long one that deserves a post all of its own. I will say it wasn't easy for anyone, but it was worth it. I can't wait to write all about it. On November 4, 2014 our daughter was born. That is also a story all its own, with way to much info and emotion to put into this blog entry. Let's just say Mira's birth was the most exciting, emotional, and unforgettable experience my husband and I have ever been a part of. We brought Mira home from the hospital, and time has just flown by. All of those years of infertility and loss that led us to adoption, that led us to Mira...it seemed like it was forever to get to her, and now she is already 2 months old. When I think back over 6 years ago when we began trying to start a family, well, it just doesn't seem like it was that long anymore. A funny thing happened on the way to infertility, we ended up exactly where we are supposed to be at this moment with our daughter. I've earned the title bad blogger. I go long stretches of time without writing any entries. I go long stretches of time without having anything to blog about. But the one time of year I know I have to blog is during National Infertility Awareness Week. That is happening right now, April 20th-26th. This is the second NIAW I have been a blogger. Before last year, I didn't even know such a week existed, even though I have struggled with infertility for the last six years. I think about all of the other people affected by infertility in some way, shape or form who don't know about this week, who don't know what resources are available to them, who must feel like they are the only ones who struggle and that is part of why I blog; in the hope that SOME of those people, even just ONE of those people, will find my blog and learn about NIAW, learn about the resources that are available to them to help them cope, to help them heal, to help them feel not so alone. And of course, I blog to share my story, to educate friends, family, and even strangers about infertility, and to empower myself and others. This year's theme for NIAW is "Resolve to know more...". I resolve to know more about adoption. And I encourage all of you to resolve to know more about adoption. I could write several entries about adoption because that is the point in our infertility journey that my husband and I are at. The truth is, adoption is such a complex process, it involves so many people, so much work, so many emotions, so much time. My husband and I signed with our agency back in October (and even making that decision had its own set of complexities; do we use lawyer vs. agency, domestic vs. international, comparing fees, etc.). We are just now finishing the homestudy process. It has been overwhelming to say the least. But those are topics for another time. What I really want to write about are the things you can do to support a loved one who is considering, or who is pursuing, adoption. 1. Be informed, be educated. Start researching adoption on your own. Learn about the difference between domestic adoption vs international adoption. Learn about open vs semi open vs closed adoption. Learn about agency vs lawyer adoption. Learn about foster to adopt. Learn about the "adoption triad" and how adoption affects not only the person or couple adopting, but also the birth family and the child. Reach out to adoption agencies for info packets. Research the costs and where the money goes. You can ask your loved ones those questions too, but it would mean so much if you would take the initiative and do some of the leg work they are doing. Put yourself in their shoes and get a feel for the research they have to do and the questions they have to ask and the road they have to be prepared to go down. Travel some of it with them. 2. Don't say to a person or a couple struggling with, or who has struggled with infertility, to "just adopt". While you may say this out of love because it hurts you to see them hurting through their inferitlity, struggling with treatments, experiencing miscarriage(s), or because you wonder how much more they are willing to go through to have a child, it doesn't help them. A comment like that just simplifies everything and may make it seem like you think they are doing something wrong, or judging them. Or, that you think they haven't considered all of their options. There are a million and one reasons why a person or a couple can't or won't or are unable to adopt at that time. Maybe it will change in the future, maybe it won't. But trust me, they have thought about it, or will think about it on their own time, in their own way and they will let you know when, or if, adoption is a possibility. 3. Don't make comments like "Once you adopt, you'll get pregnant" or "Adoption is just as good as having your own". Those types of comments may seem innocent or even supportive, but they really aren't. Once a person or a couple has decided adoption is the right choice for them, they are 100% (or should be) committed to adoption and that child because that IS how they are going to complete their family and that IS how they are going to have a child; their child. The goal of adoption is not to get pregnant. Adoption is not a substitute, it is just another way. And I can only speak for myself here, but after struggling with infertility, I really had to grieve that loss and find closure for the fact that I was never going to have a biological child, create a life with my husband who I love, be pregnant, experience child birth, etc. Adoption is a new chapter and a new beginning. And I am excited about that. But it took me a while, a lot of heartbreak, disappointment, and dealing with many emotions including guilt, anger, and self esteem issues to get to the point of acceptance and excitement about the new chapter of adoption. Adoption is a decision we had to come to in our own time, in our own way. 4. Don't say something like "Well, I could never adopt" or "How are you going to raise someone else's child". Adoption may not be for you, or you may not understand their decision and that's ok. Keep it to yourself. Comments like this are really a criticism or insult to your loved one who is adopting, and it may make them feel like, or question, if you will love and value their child, if you will accept their child, as you would a child that was born to them, even if that is not at all what you meant. Language is a really tricky thing and words have a way of staying in the back of someone's mind. Think before you speak. 5. Don't question their method of adoption. "Why are you adopting internationally instead of from our country"? "You know, there are plenty of foster kids who need homes. Why don't you become a foster parent instead"? Deciding to adopt, and what method of adoption one is going to pursue is a very personal and very complex decision. Every person or couple who chooses adoption and what type of adoption they are going to pursue is very well informed and educated. They don't need other people second guessing them, or telling them they are doing it wrong. Trust them, they know what is best for their family and their goals. Just support their decision and be excited for them. 6. Understand that they most likely have a long, difficult road ahead of them. They will give you info and updates as things progress. And be ready to support them when they do become parents, just like you would any other parents. They are going to be exhausted, and unsure of themselves, and excited, and scared. Also, be ready to support them through the wait, the disruptions, the highs of the matches and the lows when the matches don't work out. Nothing about adoption is easy; NOTHING. Now that I've given you this list, it's only fair that I give you some resources. First, check out http://www.resolve.org/infertility101 and www.resolve.org/national-infertility-awareness-week/about.html. Resolve is The National Infertility Association. If you are struggling with infertility or considering adoption or any other family building options, you can find resources and information. If you are looking for ways or information on how to offer support, or to educate yourself about infertility and/or adoption, Resolve is a great place to start. The day before my birthday we found out I was pregnant. We weren't trying, we weren't expecting, it just happened. And it was an amazing surprise. This pregnancy started off so strong. This one was a fighter. I had to get a couple blood draws to make sure the pregnancy was progressing before the dr would start me on my blood thinner and the extra progesterone. From my first blood test to my 2nd, my hcg more than quadrupled! But number can be misleading little tricksters. Anyway, I started the daily lovenox injections and the progesterone supplement right away. I was cautiously optimistic. Even when I started to notice the spotting ( because that happens in like a third of "normal" pregnancies, right?). Even though my hcg stayed low and was only minimally rising after that first quantitative hcg. Even though the ultrasound dated the pregnancy a week behind what it should have been. This was going to be one of those miracle pregnancies that just took a little time to catch up. And my due date was November 8th, my Gram's birthday. I made it to 7 weeks before we got the official "this isn't a viable pregnancy" phone call from the nurse. It was a Friday and she said, "I'm sure you know when/if you need to go to the ER. You've been down this road before. I'm sorry". Yes we had; five other times. But this time was supposed to be different. It's a weird limbo, being pregnant, but not. I wasn't a stranger in this place, but it still felt strange. Strange to know that I was expecting to lose yet another life that had started, but I just couldn't support. Strange to know that even though I was 7 weeks pregnant, the pregnancy had stopped developing around 5 weeks. Should that make me feel better, that at least I wasn't "far along". It doesn't. From that first positive pregnancy test, just like all of the others, I put on the mom hat. I can't disconnect myself from the pregnancy until it is determined to be viable. I guess that would make it so much easier. So now, I'm not pregnant at all. I got my results from my final blood draw yesterday. My hcg was at a "1". Anything less than 5 is officially not pregnant. I have to go for a follow up with the dr next week. It's weird being pregnant and then not, without having a baby to show for it. It's weird and it's sad, even if that is how it's meant to be for whatever reason. A funny thing happened on the way to infertility; I found my faith. I'm finding my faith, rather, a little more every day. I have debated writing a post like this for a while because I wasn't exactly sure what to say. I still don't know exactly what to say, but it's time I say something. Recently, I have encountered some pretty negative commentary about God's Will and infertility. I think that is a main reason I want to write this. I want to clarify how I feel about God's Will when it comes to my infertility, when it comes to my desire to be a mother. When I was in the depths of infertility, and before I started seeing my counselor, I was angry. I was so angry that if I wasn't dismissing God altogether, I was blaming Him for my infertility and for my miscarriages. I felt like I was being punished and I wanted no part of whatever I thought was punishing me. I would scream and cry and question, "God, if there is a God, why are you letting this happen to me? Don't I deserve to be a mother? Am I not good enough to be a mother? Why do I keep experiencing loss"? There was a lot of that for many years. So, that is where I was, and that is where I lived. I lived in my anger. It was all consuming, but it was easier to be angry and blame God then to just accept that some people are fertile, some people are infertile, some women have healthy pregnancies and deliver their babies, some women have miscarriages. And now I am coming to a place of acceptance, which is helping me be less angry. Acceptance doesn't mean that I am happy, it doesn't mean that I don't wish things were different. Acceptance is just part of recovery. It is part of moving forward. It is part of finding peace. So, this brings me back to infertility and God's Will. I have been told on more then one occasion that if I were meant to be a mother, God would have made me fertile instead of barren. Those are some of the most hurtful words anyone could say to me. Those are words that would have made me angry with God 5 years ago, or a year ago or even 6 months ago. But through my personal and spiritual growth, I have realized that the people who say things like that are people without compassion. They are people who like to prey on the insecurities of others. They are people who are religious, but who are not true Christians, even if they claim to be. I don't believe that it is God's Will that I am infertile. I don't believe God makes or lets bad things happen to people, or in the world. I believe that those things are just an imperfect part of living in an imperfect world. But I do believe that there is a purpose for what I have experienced and I do believe that I am supposed to use my experience to help others. I do believe that I am supposed to use the loss and grief I have experienced to grow stronger and to push forward. And that is what I choose to believe. And I don't know if it is God's Will for me to be a mother, but I certainly know that it is my will. And I don't believe I would have such a strong, innate desire to be a mother if I wasn't meant to be. I am 32 years old and have struggled with infertility and recurrent miscarriage for over 6 years. I am fortunate enough to be married to my high school sweetheart; the love of my life, Dan. My husband is my rock and I am thankful for him every day. In October of 2013 we signed with an adoption agency, and in November of 2014, we brought our daughter home. I hope to reach others, and help them, support them, educate them, and heal myself with this blog.